Seventeen-year-old Randy (Julian Walker) tries very hard to be a good person. Since his father left, Randy takes care of his emotionally disturbed mother (Mo'Nique), and he's the kind of friend all of his classmates can depend on. As strong as he seems on the outside, Randy is hiding a secret inner struggle and denial of his sexuality. It's not until he opens himself up to love that he discovers that becoming a man means accepting who you really are. Blackbird is an emotional story about a young African-American singer struggling with his sexuality and the treatment of others while coming of age in a small Southern Baptist community. Patrik-Ian Polk is the same writer/director behind the series " Noah's Arc " and the film version Noah's Arc: Jumping the Broom. He also wrote and directed the 2012 feature film The Skinny. Co-writer Rikki Beadle-Blair is also an establish filmmaker. He directed the films Bashment and Metrosexuality. Behind the Scenes of "Blackbird"
Music Video - D. Woods "Find Your Way"
Growing up gay in the South is rough-let me tell you, I know because I did it. But as hard as that is, it is even harder in a small southern town. Randy has even more problems-his parents are religious and he is also worried about what Jesus will think of him. It seems that his friends at school are more comfortable with Randy's sexuality than he is and his father who has moved out of the family home wants Ricky to accept himself as he is. Randy's main problem is that he is his mother's son and like her, he loves drama. To make matters even worse, his mother's youngest child was abducted some five years before the film starts and there have been no leads on his disappearance. As Randy struggles to come to terms with his sexual identity he has bold and intense wet dreams about a football jock which and these distress him even more. When he was cast in the school's all male production of "Romeo and Juliet", things really begin to fall apart. Then while working on a student film, his co-star Marshall obviously wants to be more than just friends and Randy has to stop screaming that he isn't gay even when he does not believe it. Patrik Ian Polk wrote and directed this film and he treats the character of Randy with understanding and compassion. He wrote the screenplay based upon Larry Duplechan's 1986 novel of the same name and changed the location to Hattiesburg, Mississippi his own home town to make it all more relatable to a contemporary audience. Julian Walker, the young lead actor is an openly gay man and was a local theater student who auditioned for the part and does a fine job in the role. The actress Mo'Nique is Randy's mother in this, her first movie role after her Oscar win for "Precious" and she is just great except for a couple of time when she seems to go over the top but she could have toned down her performance as the mother as it often went a little too over the top at times. Isaiah Washington is sublime as Ricky's understanding father (and if you remember he lost his job on television for a homophobic remark about this costar on "Grey's Anatomy". Though everyone who has ever met Randy seems to know that he is gay but his God-fearing Christian upbringing keeps him from acknowledging his sexuality. As the film moves forward, Randy's existential struggle becomes all the more real. Prayer does not make his recurring wet dreams subside and Randy's mom begins to blame the disappearance of her younger daughter on Randy's apparent queerness. All the while, Randy's friends want to help him come out of the closet. But Randy wonders what Jesus would do. 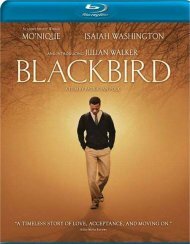 "Blackbird" carefully balances its religious conviction with an agenda to open the minds of socially conservative Christians. In the melodramatic universe that we see here, there is plenty of room for gays in Christian congregations and conservative small Southern towns. The film is more about accepting one's self, than having others accept you. Randy's mother is the only person who does not accept him for who he is, but that is only because her mind is filled with the loss of her daughter. What we see is that it is Randy's staunch moral conservatism that is the only thing that is holding him back from fully realizing his sexuality. The film perhaps might seem a bit too positive, but that is only because it takes full advantage of functioning in a purely fictional universe.